An unknown traveller has a seizure by a riverbank. A small crowd quickly gathers, attempting to hold him down until his movements have subsided, but it proves ‘impossible to keep a purchase on that half-bald cranium’. A fortune-teller passes by, also unrecognised by locals, and claims that the event marks a ‘sign from on high’, a message from the Almighty. A bridge must be built here, he says, crossing the river known as the Wicked Waters. The Three-Arched Bridge is set in an Albanian town in the fourteenth century, with Ottoman invasion imminent. When the construction process at its centre is hampered by problems, townsmen begin to believe that it is cursed. A ballad calling for a sacrifice to immure in the structure appears in local taverns, and the company assembling it offers a monetary reward to the family of any volunteer. The novel is narrated by a Catholic monk, Gjon, who speaks as a spectator despite playing a part in the events that unfold. One character tells Gjon that building is an act of evil, and the bridge seems to prove his point. Despite the act of creation that brings it into being, it catalyses destruction, distracting attention from the greater menace of the Ottoman Empire. As the attackers descend upon the town, the bridge grants them easy access. The focus on trivial matters recalls the tensions between Albanian principalities; fighting among themselves, they were left unprepared for a common enemy. History and folklore are used here to create a politically charged parable. The novel is bookended with a pair of phrases written in antiquated language, a framing technique that alerts the reader to the differences and similarities between Albania old and new. Driven by love for their country, Gjon and Ismail Kadare both wish to raise awareness of the evils perceived to surround them. The Three-Arched Bridge is a rallying call to Albanian writers of the time, urging them to combat a dictatorial regime by putting pen to paper. You can read an excerpt of the novel here. 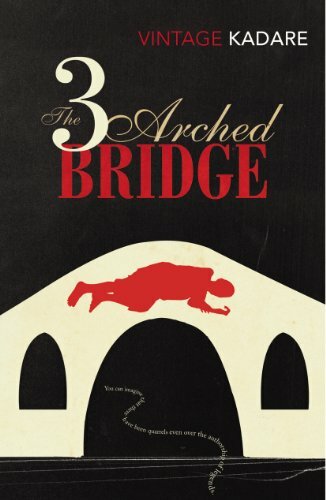 Henriette Lazaridis has written about The Three-Arched Bridge for The Millions, and James Wood has written about the author's output as a whole for The New Yorker. Shusha Guppy has interviewed Kadare for The Paris Review and The Independent, as has Noah Charney for The Daily Beast. In a 2013 article for World Literature Today, Nina Sabolik argued that Kadare should receive the Nobel Prize in Literature. If you would like to read more by the author, you can find a selection of his poems on the Albanian Literature website. Which books, poems, or stories about small communities would you recommend, and why?